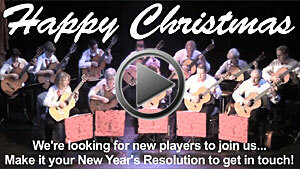 We want to wish all our fans from afar and all our local audiences a Merry Christmas and a Happy New Year. Spend 60 seconds with us - we have put together a little YouTube video. And if you have a little more time, please visit our 2014 photo gallery. We had a super evening two days ago, with our now-traditional trip down to Portsmouth to play Carols and Concert music to a wonderful audience of residents at one of the Sheltered Accommodation complexes. 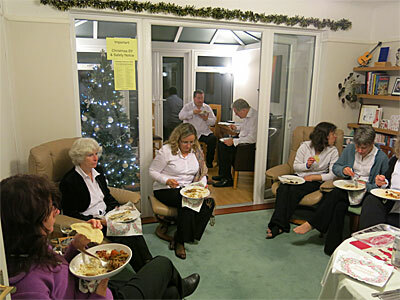 And afterwards we moved from Carols to Curries & Chillies, with food and drink, and more food, and more drink, back at our Musical Director's house. 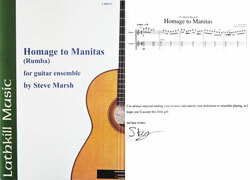 "I have always enjoyed your reviews (*) and admire your dedication to ensemble playing"
(*) Derek reviews ensemble music for Classical Guitar Magazine. Derek, our Musical Director has added another "one-page technical teach-in" to his website. 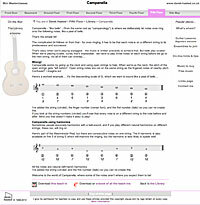 These "mini-masterclasses" are one-page introductions to topics that don't often feature in most guitar tutor books. The most recent topic is about "Campanella". It that's not a guitar technique that's familiar to you, click on through. We've just sent out a new "hago newsletter" to our worldwide subscribers. If you'd like to subscribe (we send about 5-6 newsletters a year), visit our Social Networking page and fill in your name and email address - you'll get an email asking you to confirm and then you're on board. And yes, those are ears. And that is a bowler hat. 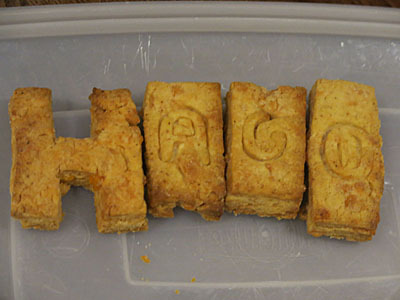 hago - showing the world that music isn't to be listened to in total silence - it's for enjoying. Following on from our House Concert in for the residents at Homewater House, we've learned that the audience enjoyed it so much that they raised £66 for a charity of their choice when the hat went round at the end of the evening. 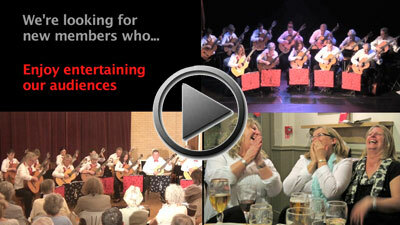 We really enjoyed playing for them and we've been invited back, so it seems they really enjoyed it too. It was such fun when they all sang along to some of our pieces! Work continues to try to make the principal pages of our website easier to use on mobile phones, but one side effect is that this page might get flagged as having been changed when actually it's the gubbins behind the scenes that's altered, not the content! Our concert last night was really fun! Thank you for a fantastic evening of incredible guitar playing. We now have two very tired children but they enjoyed themselves very much (especially Calum - you have sparked his enthusiasm again after a long break from his lessons over the summer). Many thanks. Hope to see you again sometime soon. We've heard that we raised about £400 for their building fund - exact figure soon. We've put some photos from last night in our 2014 gallery - scroll right to the bottom! It's going to be a long job but we're starting to try to make the hago website a little more "mobile-friendly" for those who visit via smartphone. Not a lot to show for our efforts yet, but stay tuned! We're saddened to no longer be support partners of Portsmouth Music Hub, but we are regrettably not in a position to pay out of our own funds to provide music for them, and we have not been able to identify anyone coming to our concerts directly because of the Music Hub. We wish them well - they are doing a great job for Portsmouth Children. Over the weekend we migrated our occasional newsletters from the old "handraulic" system to something a little more elegant. Mobile friendly too - our newsletter is now easier to read on hand-held devices. August 30th - calling all Classical Guitarists - hago wants to know if you want to join us - check out our "behind the scenes" video to see how much fun we have! We're looking for guitarists who are Grade 4-5 standard or above, and who want to be part of a long-established group that always makes their family-friendly concerts are real evening out for the audience. August 10th - it's always quiet for hago in the month of August - we're too busy building sandcastles and wearing our Kiss-me-Quick hats to get together to rehearse, but we're meeting up soon, and getting ready for our concert on September 27th, which, we notice from the St Johns Church Website, is at midnight. We're unsure whether that's midnight at the start of September 27th or the end, but whichever it is, we'll also be playing at 7:30 in the evening! August 10th - on our Facebook page today - "Saw them in concert in Basingstoke earlier this year and they are brilliant". July 8th - we've heard today that our concert last Saturday raised £580 towards Hayling Island's presence at the World Scout Jamboree - a fantastic total - thank you to everyone who came along .... it was you that raised this magnificent sum. Our total raised for good causes is now £64,271! The sound of leather on willow outside - the cricket team were playing a leisurely game well into the evening. The sound of flesh on cedar inside (well, strictly speaking, it was more "nail on nylon", but that doesn't sound as poetic). We'll let you know the fund-raising total as soon as we have it. June 8th - we're busy rehearsing for our July 5th concert (booking details here) - it'll be great to return to Hayling Island again - our third visit there, if we're not mistaken. It's a good-sized venue - it'll accommodate 250 maximum - so we do hope you'll be able to come along. There are excellent pubs nearby for a pre-concert tipple, or you might like to sample Fish and Chips on the sea-front before enjoying our varied and exciting programme with pieces from all eras of hago's 100+ concerts. I just wanted to say thank you for the guitar orchestra's set on Saturday, everyone had a great evening and the feedback has been excellent, all that I spoke to thought the playing was superb. It has also been a financial success for the Lions and on first count looks to have raised just over £1,000 all of which will be put to great use. March 31st - was it a Mobile Phone, a Morris Dancer, or Santa Claus in our recent concert? March 30th - what a lovely, lovely audience at our concert in Basingstoke yesterday, for Basingstoke Lions and also featuring Basingstoke Rock Choir. We will post the fund-raising total here as soon as we have it. March 16th - we had a ball at Hythe URC - Cornerstone - last night, raising funds for their Outreach project. We've put a selection of photos in our 2014 gallery. 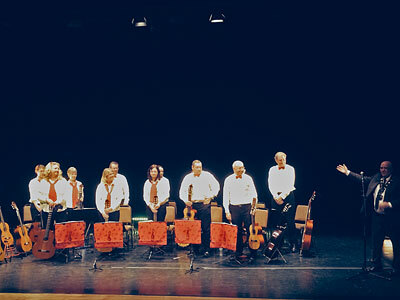 March 2nd - it was a privilege to play for such an enthusiastic audience last night at Dorset Guitar Society. "Thoroughly enjoyed your programme, superb performance and jolly jokes. A brilliant evening with you. Thanks "
"...it was certainly a super concert..."
February 25th - we'll be raising a glass later this evening - hago is 15 years old today! The fund-raising total raised for the Mayor's Appeal was £588, split between the Marie Curie Cancer Care charity and Eastleigh Young Carers. February 7th - The Point was a lovely venue for our concert last night. Congratulations on an excellent evenings entertainment from Marie Curie Fundraising Hampshire and Isle of Wight. I was there as a volunteer representing Marie Curie, Malcolms chosen charity for his Mayorship. Only sorry I was unable to thank you personally as I was helping look after our guests. Sure you will go from strength to strength. Your support for our charity is much appreciated. BRILLIANT EVENING - as always.. thank you all for venturing out in the awful weather & giving us such an enjoyable time!! January 1st - Happy New Year everyone - we start the year having raised £61767 for local good causes since hago started, way back in 1999. As 2013 drew to a conclusion, we learned that our videos were seen over 17,000 times in 2013.